Contagious Generosity and Unexpected Happiness? Here at You Can Grow That! we love the idea of spontaneous acts of kindness and beauty. That’s why we’re promoting the idea of Giveaway Bouquets on our home page. The idea is simple: grow flowers, cut some regularly, and deliver to total strangers who don’t expect them. Place the flowers in a recycled vase of water and give them to people who could use a lift. Think nursing homes, hospices, cancer treatment facilities, homeless shelters, and veterans hospitals. Give out small bouquets to the cashier in the supermarket, a bus driver, or the sulky teenager hanging out by the coffee shop. Send a flower up the pneumatic tube at the bank. You get the idea. Flowers make people smile and when we smile it changes brain chemistry to improve our moods. So delivering unexpected bouquets spreads happiness. 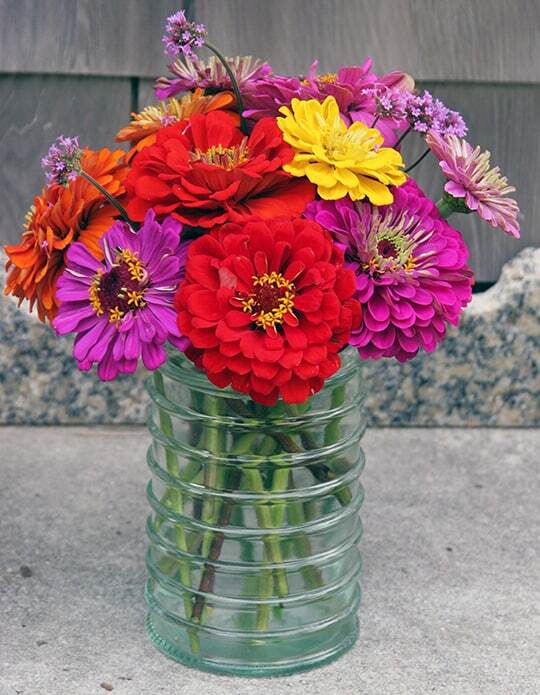 Being unexpectedly handed a colorful bouquet of zinnias will make anyone smile. The beauty of Giveaway Bouquets is that it’s something that individuals and groups can do with little investment. Get your scout troop, Master Gardener organization or 4-H club to plant cutting flowers then arrange and deliver weekly bouquets. 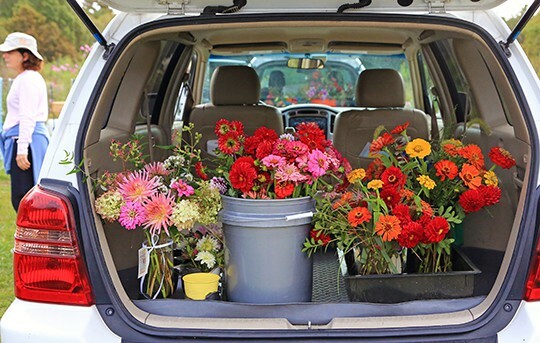 Those who don’t want to arrange the flowers into vases can check with the activities director at local nursing homes and assisted living facilities…cut flowers can be delivered in buckets so residents can make small arrangements as an activity. These can be placed in private rooms and public areas, and the residents have the fun of creatively using colorful, garden grown flowers. This often sparks memories of what relatives grew, or gardens that they’ve cultivated in the past. Most Giveaway Bouquets are presented to individuals, unexpectedly. Putting a vase in a lobby or other public place is expected and doesn’t have the same impact. A bunch of colorful flowers, anonymously and unexpectedly given, however, makes an impression. Every town in America has dozens of people who need a lift, and You Can Grow That! These gardeners on Cape Cod grew hundreds of cutting flowers in a community garden plot. Many are arranged in recycled glass vases and others are delivered to local nursing homes for their activity time. Once a week the gardeners gather to cut and arrange their Giveaway Bouquets. By mid-October they’d delivered over 1,000 arrangements. That’s over 1,000 smiles and spirits lifted. You can grow that too! The use of the phrase You Can Grow That! was first suggested by C.L. Fornari who has launched this website. It has always been her hope, however, that this phrase could be adopted by all garden lovers and the horticultural industry. If you’re interested in exploring this, please use the contact information below.